Students and the elderly from Mei Foo Elderly Centre enjoyed a memorable sharing session during the activity held on 2nd December, 2015. Students shared their experience of using smart phones while the elderly shared their personal stories as well as their career achievements. Students and the elderly from Mei Foo Elderly Centre enjoyed a memorable sharing session during the activity held on 30th November 2015. Students played ping pong with elderly. The elderly shared their working experience and their habits with our students. Students from 2P enjoyed a cheerful session on 21st November, 2015 with the students from five Po Leung Kuk primary schools. Students facilitated the schools for sports day events. Students showed their caring and concern through interacting with the primary students. Students and the elderly from Mei Foo Elderly Centre enjoyed a memorable sharing session during the activity held on 6th November 2015. Students shared their learning experience in this school. The elderly shared their life experience and their experience in learning calligraphy. 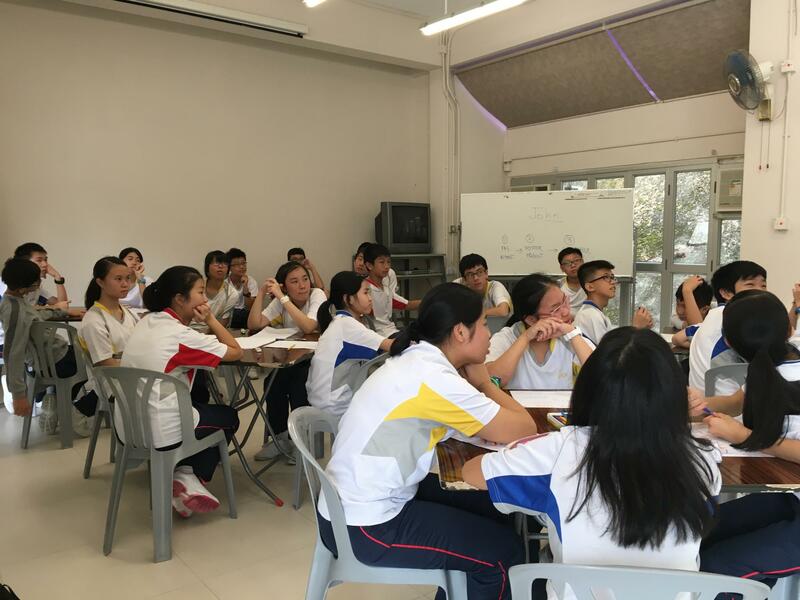 Class 2P, 2A and 2B participated in an English day camp at Jockey Club Yuen Long Recreation Centre on 20th November, 2015. They learnt and practised English in a real situation; interpersonal skillls was enhanced through group work and interactive activities. Students enjoyed and learnt through different activities both indoor and outdoor. Students were invited to do a role play and joined in a mini-forum outside the canteen on 25thNovember, 2015. The topic of this year was "Is removing garbage bins in the countryside, helpful or unhelpful to the environment?". 50 seats are full, some students were standing around to enjoy the discussion and waiting a chance to present their ideas. The 2015-2016 First Uniform Test Academic Awards Presentation Ceremony was held on 24th November, 2015. The book fair was successfully held from 18th to 19th November in the school hall with The Commercial Press (H.K.) Ltd. Students had a large selection of books to choose from at the exhibition booths. Chinese & English fiction, non-fiction books, supplementary exercise books and stationery were displayed at the book fair. We hope to broaden students' scope of reading and help them nurture a good reading habit through activities such as the book fair. The school picnic (F.1) was scheduled on November 13 this year. All Form 1 students went to Po Leung Kuk Pak Tam Chung Holiday Camp on that day. Surrounded by hills and trees, the campsite is a fantastic spot for students to enjoy the natural environment. Apart from that, students also took full advantage of the recreational facilities there.